Playing HD videos on the iPad (with the retina display) is an amazing experience in itself. All the iPads including iPad Pro, iPad Mini 4, iPad Air 2, etc. are picky at file types such that you can’t import every video to your iPad directly. If you have a lot of .mkv format files (HD video, 720p/1080p), you’ll find that the iPad doesn’t play those. Video content that has AC-3 video (99% of mkv files) aren’t supported directly and you’ll need to use other methods. Although there have been licensing issues of late, the App Store has quite a lot of apps that let you watch MKV video files without any issues. Note that these apps won’t let you watch DRM-protected content (downloaded from iTunes) but you can watch content that you’ve got synced into your iPad or have on your PC. 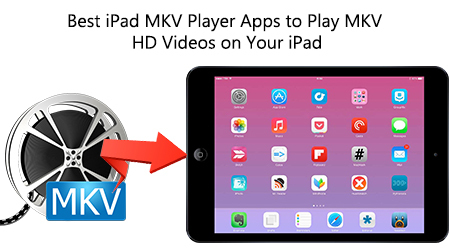 Here I’m rounding up top eight of the best iOS MKV player apps for iPads, to help with your quest to circumvent the limited MKV video format playback of the default player Apple supplies with iOS. Note: Also note, although we’ve listed most of the apps here as “free”, these are the “lite” versions where you’ll be shown ads or links. You’ll need to buy the pro versions to enjoy an ad-less experience but you can definitely try these out before your purchase (part of the reason why we listed the free versions). When you talk about best MKV players, you can get a better option than PlayerXtreme Media Player. This app has some amazing features like organizing your movie collection, better navigation and search, directly play files from email, control subtitles’ font size and language, forward and backward options are responsive. You can also set the password to the libraries to secure your files and personal playlists. With these many features in the app, this seems to be the best in the list. If you just depend on YouTube for videos and movies, Fast Tube HD video player is the perfect app for your iPhone, iPad or iPod touch. You can search any YouTube video within the app and watch the videos in HD. The app is safe to use and it responds pretty quickly for all the actions. Sharing the videos on social media platforms like Facebook, Twitter etc is easier than never before! Most interestingly, it doesn’t store any history, cookies or cache. “playable” is a simple and clean. It’s handles mkv formats well but not the HD formats. However, it supports HD for every other format. You can stream and download files without using iTunes through the built-in browser. HD MKV Player is built by the same folks that built “playable”. The app is a larger version of playable where this includes capabilities of playing HD videos in mkv format. The annoying feature is it shows ads on top and bottom of the video which would be distractive. The app is otherwise great, offering similar functionalities as “playable” albeit in HD. VLC Streamer is strictly a streaming app. Have files on your PC? Stream them on your iPad or iPhone wirelessly or otherwise with this app. VLC Streamer has won a lot of accolades for it brings enormous support and fast processing. Don’t forget to check out our recommended paid and free video players for iPad. And check out how to transfer videos from your PC to Mac to your iPad. And playing MKV videos on iPad is quite a headache if you just use its native video player, for all the iPads only support M4V, MP4 and MOV formats, which is quite limited. Even with a powerful MKV player, you may still get trouble during video playback on your iPad Pro, iPad Mini 4, iPad Air 2, or iPad 3/2. Sometimes, a special video format may cause your iPad crash. Therefore, video conversion is quite urgent. After read the Top iPad Video Converter review, you may found that Pavtube Video Converter Ultimate (available for Windows and Mac users <El Capitan 10.11.2>) is a recommended tool here. With it, you can convert your any video including MKV, VOB, AVI, TiVo, H.265, WMV, FLV yet DVD/Blu-ray to iPad supported video formats with fast speed and high output video quality. Now let’s see how to use it. Install and run this software. 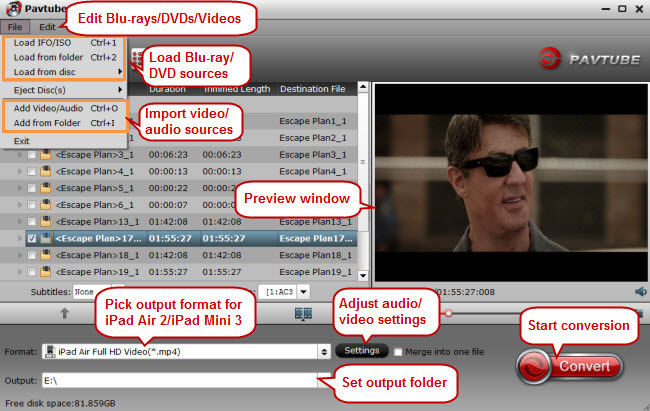 Click the “Add Video” button or directly drag-n-drop your video files to the program. You can add multiple files to convert at a time. Click “Profile” box and move mouse cursor to “Apple” category, video presets for iPad Air, iPad Mini etc. are provided. Hit the “Convert” button. Then this video converter will instantly start the conversion process and the progress bar will show you the remaining time. After several seconds, you’re done! After getting the converted movies files, you can transfer the converted HD Movie files to iPad Air 2 via iTunes. Pretty simple. Now you can start playing HD movies on iPad Air 2 anywhere you want them.